Labelle Roofing Property Maintenance, New Roofs, Flat Roofs, Guttering, Facias and more... Labelle Roofing are a small, professional, family run business specialising in roof maintenance, new roofs, flat roofs, pitch roofs and roof repairs. Dave Labelle, has been in the roofing business since 1972, and has worked successfully with several local councils such as Merton and Sutton council and Housing associations. The company also carries out a large amount work for local schools including maintenance, new roofs, Guttering and Downpipes, Fascias, Soffits and Cladding, as well as Cleaning and Renewal. 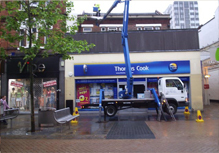 As part of our roofing services we also utilise the services of Cherry Pickers (Maximum height = 20m , Outreach = 9m) for ease of access, where appropriate. Labelle Roofing are members of the Contractors Health and Safety Assessment Scheme (CHAS) as well as Construction Line and have £5 million Public and £10 million Employers liability insurance. Labelle Roofing offer a 10 year guarantee, as standard, for all New Roofs and can also arrange an extended guarantee insurance backed by up to 20 years. As members of the Confederation of Roofing Contractors, Labelle Roofing are able to offer the security of a large, national roofing company, whilst maintaining the personal and friendly service you would expect from a local business who takes pride in customer satisfaction. Please feel free to give us a call, direct on 07831 855 333 David or 0788 754 1499 Jason. We would be pleased to answer your questions and more than happy to provide references from past clients.